There were six companies of the 110th first battalion already settled in the cantonments, and at dinner in the mess Paul and Carl were introduced to their fellow officers. The meal was rich and heavily spiced and seemed to go on forever. As the afternoon wore on into evening, Paul was faintly astonished at the quantity of wine and brandy being consumed. He excused himself fairly early on leaving Carl and the others and made his way back up to the lines where his tent had been erected. His men either sat or lay around in their bedrolls drinking, talking or gambling and they greeted him cheerfully as he passed. Paul went in search of O’Reilly. “They’ll be going for longer than that I suspect, but I’d had enough. It’s as stuffy as hell in there.” Paul motioned him to follow. Outside his tent he pulled out two camp chairs, leaned back and looked up at the stars, brilliant in a clear black sky. “I prefer this. I did, however, manage to liberate this.” He pulled a bottle of brandy from his coat. Paul rummaged for cups and they sat in silence for a while, listening to the sounds of the camp. Eventually Paul stirred. “I shouldn’t think the officers will be fit to stagger in the morning, let alone fight,” Paul said with a laugh. “I’ve never seen you drunk,” Michael said studying him. “Or the loss of control,” Michael said quietly and Paul looked sharply at him and laughed. Paul looked across at him and smiled. “I thought I was,” he said quietly. An Unconventional Officer follows Paul’s early career from a junior lieutenant in India through the wars in Europe to Portugal and Spain. A talented and charismatic leader of men, he needs to learn to curb his temper and adjust to the rigid army hierarchy in order to rise in his chosen profession. On the way he makes enduring friendships forged on the battlefields of India and Europe and builds an unexpected bond with the difficult, unemotional commander of the Peninsular army, Sir Arthur Wellesley. Amidst the violence and tragedy of the war against Napoleon an unforgettable love story unfolds which affects the lives of everybody it touches. An Unconventional Officer is the first book in the Peninsular War saga which tells the story of the men and women of the 110th infantry, a regiment like no other in Wellington’s army. 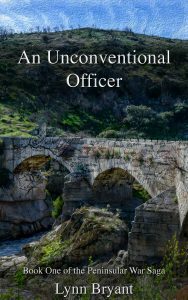 An Unconventional Officer is available on Amazon Kindle for £1.99 or in paperback from Amazon for £13.01.